White Wolf : The birth of three white buffalo - An Extraordinary Sign! 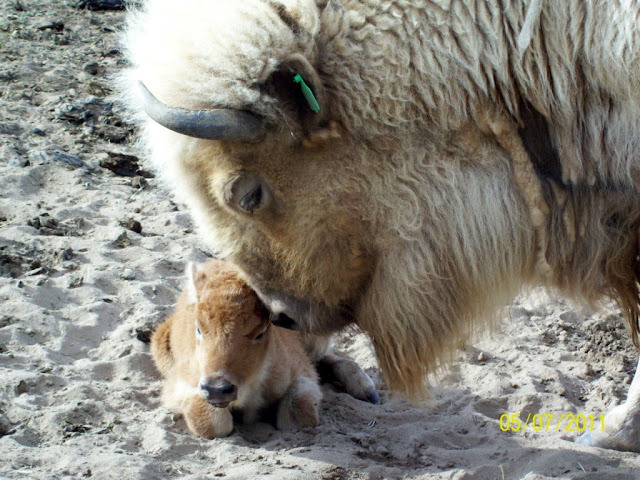 The birth of three white buffalo - An Extraordinary Sign! This year on Mother's Day weekend in America, a very special event took place. Three white bison calves were born in Bend, Oregon into a herd of 11 white buffalo. This herd of 11 white buffalo was moved up from Arizona last August, when the owner of the herd's dying wish was that they move to greener pastures.. These newly born white bison are not albino -- which have pink noses and eyes, but rather these rare babies have brown noses and blue eyes. And they were born big and strong and very white which is a very good sign that they will make it to adulthood. In some Native American cultures the White bison symbolize peace and prayer. So the birth of three at once is considered to be an extraordinary event at the nonprofit, Sacred World Peace Alliance where they were born. "There are some prophecies that say if the buffalo come to the western shores, world peace will begin," said the president of SWPA, Cynthia Hart-Button. "And we're seeing changes. It's a sign of change to the world." She also added that according to history, the chances of a white buffalo being born is one in 10 million. Sioux mythology has a female character of supernatural origin referred to as the White Buffalo Calf Woman. According to legend, two men were sent out by their starving and demoralized villages to look for buffalo herds near the Sacred Hills, also know as the Black Hills, in western South Dakota. They had a vision of a maiden dressed in white buckskin, who told them to prepare the villages for her arrival. She appeared soon after and brought prayers, teachings, a sacred pipe and other offerings. She promised to return someday to renew the people's faith and spirit, and as she departed, she turned into a buffalo calf. She rolled over repeatedly, changing from black to brown to yellow to white. Ever since, the white buffalo has been viewed as a return of the maiden and her promise of renewal. Responses to "The birth of three white buffalo - An Extraordinary Sign!" What a great post White Wolf. Being of native descent, I try to follow these types of events but I had not yet heard about these. Thanks for posting it. I will link to your post in my blog. Keep up the great work. Thanks. Thanks for every great new that you give us, your readers. I love white wolf pack because I love animales and nature life, but over all, I love wolfs. You work make me feel happy almost every day. Magnificent! This makes me feel hope. Thanks so much, White Wolf! This was just so beautiful, thank you for sharing. If only the whole world could see this ! There is a birth and a death happening. Which one we focus on is what we get..
Fukushima is the death and dying part. Those focusing on carbon fuels and nuclear are killing life and dying at the same time. Those focusing on the new, green, more sustainable ways of living are being born again, to live together in peace and harmony, as ONE people, on ONE planet. People need some hope. This is an outer sign that may give people a sign that there is a beginning of world peace. In my view, real world peace is all an inside job. We have to go inside and focus on meditation, prayer, and contemplation of a Higher Power, Great Spirit, God or whatever we want to call it. I think this is a wonderful sign! I needed some hope in this world. How exciting for the whole world! I agree that there are changes coming for Mother Earth. Spirituality is becoming stronger and more people are turning inward and discovering all the answers that lie there. And more and more of us know that there is one consciousness and we are all a part of that. I am happy for the Lakota and those who come from that tradition. There is hope there and it is great that the "world" knows of your prophecies HOWEVER as w/things native the many seem to gloss over the OTHER many native people who are not of that tradition and are struggling w/ their own continued genocide within this country alone. Too many people think that if they recognize ONE native thing "they have done their job" and peace will come to all. There still are many who are fighting for native peace, parity and recognition in Native California, Native Hawaii, Native Washington state, Native Arizona , Native Nevada and Native Oregon all Western shore/states. May the goodness of the Lakota prophecy bear good fruit for those who honor that tradition and may they remember/honor the others in this nation's native family awaiting for their prophecies to come true too! wow how awesome is this !!! 3 born on the same day at the same place and on mothers day taboot ! what r the chances eh ! i guess pretty high ! 3 Calves were born? :) 3 is a sacred number, in many traditions. This gives many people great hope. I thank you White Wolf Pack and The World Peace Alliance. for your hard work, and dedication to Earth, and Spirit . Wow sooooooooooooooooo awesome . FANTASTIC !!! gREATZZZZZZZZ from out of Holland . Indian music has saluted Yahweh for many thousands of years before other cultures adopted the same. Simply amazing. This gives me hope for the future. I am heading to Bend this weekend for river rafting, is the public allowed to come look and take pics? Are we able to come and visit? Seeing them would be a great road trip. I used to visit Miracle the white buffalo in Janesville Wi.. So powerful. Thank you Creator for this gift. Im not Native American, but I loved this and it gives me hope.